Two years and seven months after becoming a software consultant I know a little more about business travel. 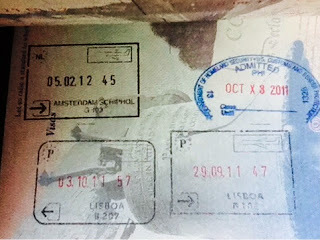 Some of my earlier international trips. You can tell because the dates are backwards (May 2012 and Sept/Oct 2011). You can guess airline carrier by connecting flights (or lack thereof). "Was that direct flight to the Bay Area on Southwest?" "Oh so Phoenix was your hub, was it perhaps US Airways (now American Airlines)?" "Amsterdam? KLM!" You know which airport seats to sit at by looking for the power cord rather than just power outlets. You recognize airport personnel, or worse they recognize you (I've only experienced this once but the joke for serious travelers is when your local airport starts holding your mail). You have extra third-party phone chargers, headphones, and electrical adapters. The different brands remind you of where you got them. You have more gloves, cuff links, and other accessories than you really need. You have more 3oz (100ml) versions of toothpaste and other toiletries than the normal-sized versions. You've tried travel toiletry packs and re-usable containers but found they weren't worse the hassle (or maybe you did--I still have my first "men's travel" kit bag but the last "Free 3oz Bag!" died in two trips). After reading Great by Choice (great book, btw), I made my own travel SMaC (specific, methodoligical, and consistent) list. SMaC's are simple recipes that help guide good habits and avert the worse through simple lists that turn into habits. This grew out of practice and I don't always follow this. But when I do these things, travel seems smoother. What did I miss? What's on your "You Know You Travel A Lot" list or Travel SMaC?